The National Institutes of Health has announced the cuts to medical research that will be required by the federal budget sequester. Although the new cuts hurt, the proportion of grant proposals being funded has been dropping for many years. The stunning change in the chart is the increase in the number of proposals over the past decades. Scientific teams and administrators can easily spend hundreds of hours on a single grant proposal. You are looking at many long, long workdays and worknights in those blue bars, most of which were for naught. Is the total grant money available dependent on the number of applicants? I have been told that that’s true for NSF grants, or at least for NSF postdoctoral fellowships in mathematics. NIH makes the case to Congress each year in part based on the number of applications, e.g., “Look at all the good stuff we couldn’t fund!”. But I am not sure that influences Congressional appropriators very much if at all. The Panel could find fewer than 3 of 100 out of a fairly large number applications that were “high priority.” Really? From cover page of the notification: “Funding rate is likely to be significantly lower in the current fiscal year (FY2013) compared to the past.” Last time in my group the success rate was 14.3%. Probably will be 5-7% this time. So, in answer to your question Allen K., no. Total grant money available at NSF is not dependent on the number of applicants for my biologist colleagues, and probably not for postdoctoral fellowships in mathematics either. Until the norm returns to ~1/3 funded:~1/3 funded after revision:~1/3 hopeless, American science will continue to die on the vine. And as research groups are dispersed and people rightly conclude that there is no future in basic science in this country, the trend will become irreversible. My best graduate student in my previous position won two very competitive postdoctoral fellowships, worked hard for 2 years, took a look around, and then said “No thanks. I will not spend my life having my work judged very good/excellent/outstanding and nevertheless fail.” She was always a smart one. Perhaps that is a feature, not a bug, for the 1% and their handmaidens in Congress? Word. I dropped out of science in the mid ’80s, and ended up working for Mammon, although not as a quant. The intellectual standards are lower, the pay is higher, and there is less need to hustle for a buck. What’s not to like? This sort of stuff makes more sense for us as a society as a way to fund, say, the Pentagon. And if we did fund Pentagon projects at a rate of 2.6%, we’d have a plenty of funding for medical research…and most of the rest of things decent societies can afford. And the reported success rate is actually jiggered to be high — the rate of success on first submission is about 10% and on re-submission about 7% — giving the total of about 17%. For any one application submitted, the probability is lower than the graph shows. (A re-submission is nearly as much effort as a first-time application.) And people who don’t get funded in the first round are getting great scores, positive critiques with no criticisms, so they don’t know what to do for a re-submission — they just screw around and hope they get a better set of reviewers the next time. No doubt Paul Ryan and his fellow House Republicans will be delighted by this. Hey, if you want medical research go buy some test tubes and do it yourself. No need for the government to fund these socialist academics. They can’t be trusted anyway, since we know they make up all that climate change stuff. Nevertheless, isn’t there a large imbalance, not only in the USA but in other countries, between the funding of biomedical research and of all other areas of science and scholarship? 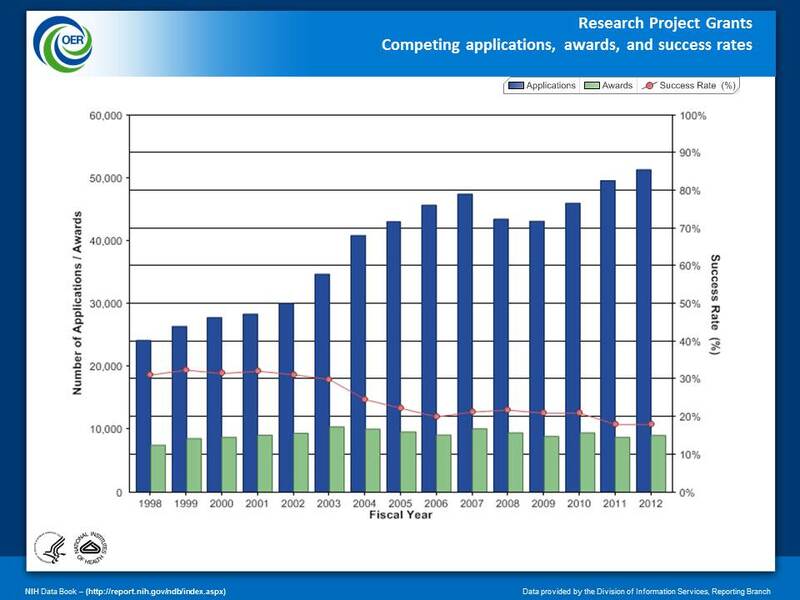 Perhaps the declining success rate of NIH applications results from increasingly ingenious attempts by researchers in slightly related areas, denied NSF funding, to package proposals as medically related. The discovery of the DNA code was funded by the UK Medical Research Council – but it was an extreme stretch to say it had anything to do with medicine; even 60 years on there’s little progress in treatment to show for it, but a revolution in biology. I inquired last week about visiting the Spanish-German astronomical observatory at Calar Alto near Almeria. Not only have the visits been cut, the observatory itself is likely to be mothballed after 75% budget cuts. Not too many people who are denied by NSF are able to repackage the application for success at NIH. The big surge in applications contemporaneous with the accession of George II was due to the crunch that came when the NIH budget stopped growing, admittedly after the problematical doubling of the budget under his predecessor. Still, the NIH budget is at least 20% smaller in real terms than it was 10 years ago. Plus, there is no effective limit on the number of applications a principal investigator may submit and there is no reasonable requirement that he or she devote a realistic percentage of effort to any given application. A major problem is illustrated by the investigator with four large R01s (the primary vehicle for NIH support) in which he devotes considerably less than 20% of his effort to any particular application (I know this person, and many more like him; sometimes the effort is as little as 5%). The general public rightly believes that his grant money is used to pay his students/postdocs/technicians and supply them with the means to do their work. But this money is also used by his institution to pay a large part of his salary, on top is his clinical income. Not only that, but if he brings in $1,000,000 in “direct” costs, his particular institution gets another $720,000 in “indirect” costs (72% overhead) to pay the electric bill among other essentials such as a Senior Vice-President for Wellness. His salary comes out of the direct costs, btw, not overhead where it really belongs. Anyway, I am, for their fundraising purposes only, an alumnus (former postdoc) of perhaps the best US medical school, an institution in the largest city in the southern-most Mid-Atlantic state. The rich get richer, until they don’t. I have recently received more than one letter asking me to contribute to their “Bridge Fund.” This is a pot of money used to tide over the select when their NIH funding is interrupted due to failure of a grant renewal (renewal rate in 2000: 53%; 2012: probably less than 25%). Those letters go in the round file. When Johns Hopkins has the sniffles, the rest of us are on our deathbed with double pneumonia. Which is not to say that many of the best of the best are not at Hopkins, Stanford, Harvard, UCLA et al. But not all of them are there. And I don’t care how good they may be, they can’t do it all despite their delusions. After Goldwater and Nixon debacles, the rich decided that lawyer Powell was right and that the US was suffering from an excess of democracy, and they put St. Ronnie into power to deliver the ugliest of policies in the pleasantest way, and it’s pretty much been downhill from there. Or as one baron of a prior era said, “I can always hire one part of the working class to murder the rest.”. The Ryans and the Palins flow easily from the same disastrously wrong turn … The fact that when you put government in the hands of people who think government is the problem, they prove it. I understand it’s an ethically questionable proposition, but one solution to this anti-government dreck is to simply deny folks like that any drug, procedure, device, or other technology funded in whole or in part by government research dollars. They’d get what they want and deserve in medical care. Society could then devote the savings to healthcare for folks who aren’t so picky about implementing the conspiracy theories they buy into.